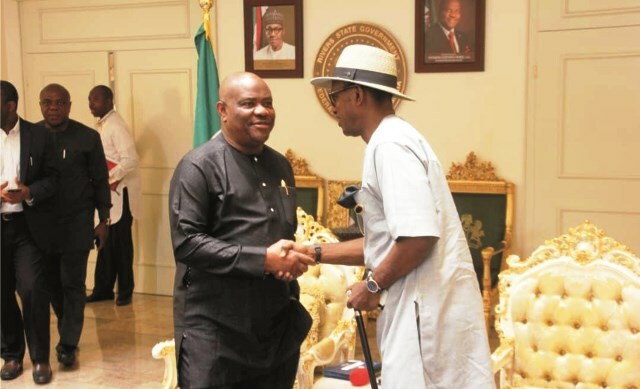 Rivers State Governor, Chief Nyesom Wike (left) , in a handshake with Secretary to Bayelsa State Government, Pastor Kemela Okara, during a condolence visit by a delegation from the Bayelsa State Governor to Governor Wike at Government House, Port Harcourt, recently. 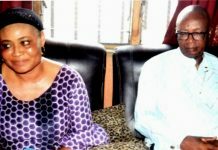 Niger-Delta agitators, last Saturday, raised an alarm that the Federal Government was carrying out ethnic cleansing against the Ijaw people and deploying “shock awe technique” among others to overawe and silence those it considered opponents of the President Muhammadu Buhari administration. 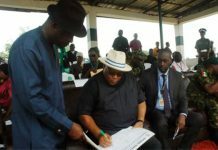 The agitators, under the auspices of the 21st Century Youths of the Niger Delta and Agitators with Conscience, in a statement by their leader, W O I Izon-Ebi, called on the United Nations, European Union, United States and British governments to intercede immediately to stop the well-orchestrated ethnic cleansing. “We use this medium to call on the international communities, the United Nations, the European Union, the United States, the British government to intervene immediately because there is an ethnic cleansing going on since the inception of the Muhammadu Buhari- led administration. “This administration is using divide and rule technique and two other techniques to eliminate our distinguished personalities. One of the techniques is the shock- awe technique on those that they cannot kill directly or arrest and detain on trumped- up charges.